The Olentangy Liberty girls volleyball team dug itself out of a hole and knocked off host Olentangy in four sets to take sole possession of second place in the OCC-Buckeye Tuesday night in Lewis Center. 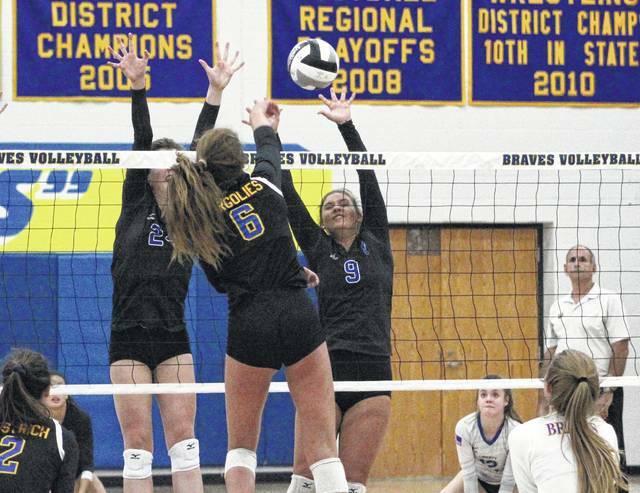 The Patriots (13-1, 4-1) won 23-25, 25-21, 25-18, 25-18 to stay a game behind first place Olentangy Orange in the league at the midway point of the conference schedule. Erickson gave Liberty a lift with seven solo blocks. She assisted on four blocks and finished with eight kills to spark the Patriots. Maddie Fogg had 42 assists and two aces, Claranne Fechter had 12 kills and Cameryn Dyer had 18 digs to lead the Patriots. “Like I said at Orange, if we can get our middles going and we’re passing well enough – that’s when we compete,” Chapman said. Taylor Karlo finished with 10 kills and Heather Littlejohn added nine for Liberty, which won its seventh straight. Olentangy coach Sarah Wilson was not as enthusiastic as she was last Thursday when her squad battled, but ultimately lost in four sets at Orange. “I think there were some players that really wanted to work hard for the team. I think those ‘some’ need to work on infecting the others with how hard they work and it’s not for the attention and it’s not for the stats,” she said. “I think we had the opportunity to take last week and grow on it. Some (of the girls) did, some did not,” she added. Maris Kaiser had three aces, Madyson Chitty had 24 digs and Olivia Margolies had 22 digs and a .373 hit rate to lead Olentangy (8-4, 3-2). Next up, both teams have non-league matches at home Thursday. Olentangy hooks up with Marysville and Liberty faces off with Upper Arlington. Olentangy Liberty’s Heather Littlejohn (9) and Abby Erickson jump to try and block a shot from Olentangy’s Emily Margolies (6) during Tuesday’s league showdown in Lewis Center. https://www.delgazette.com/wp-content/uploads/sites/40/2017/09/web1_libveebsblock.jpgOlentangy Liberty’s Heather Littlejohn (9) and Abby Erickson jump to try and block a shot from Olentangy’s Emily Margolies (6) during Tuesday’s league showdown in Lewis Center.